VQstands for "Vintage Quality". It's a sample library for Kontakt 4 and above that features a 1964 Ludwig Hollywood kit recorded with 12 mics in a wooden studio. This is, by far, the most complex library that I've ever done and it's also the best sounding kit that I've ever heard. 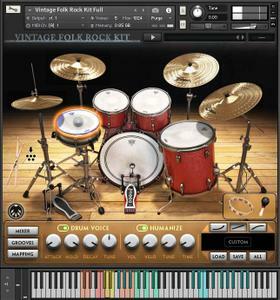 It features a great sounding vintage drum kit recorded with great sounding mics and preamps in a great sounding studio with a nice interface and state of the art scripting implementing pioneer features. It's really hard to get it better. On the main section you can choose between 2 snares, 2 kick beaters and 2 ride cymbals. 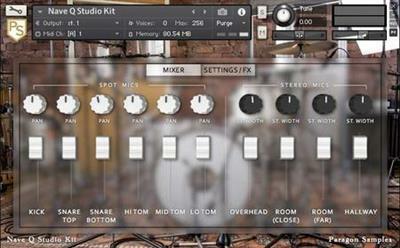 On the mixer section you can mix each microphone with purge/load, pan, volume and output selector controls. On the effects section you can apply EQ and compression to each channel independently. On the settings section you can control the volume, tune, envelope and mapping of each articuation separately, velocity curve, microphone bleeding, and enhance the kick and snare with subharmonic content and filtered white noise. This the most versatile drum library that I know, that's why also included Artist Presets by Dan Zank, Tapsa Kuusniemi, David Hurst and Jesús Ginard. From vintage funk to EDM ready to play! And we'll be adding more presets down the road. It won't go any better than this! For Kontakt 4.2.4 or superior.